Your Dollhouse Sales Page. Find the best deals in the house here. Welcome to your Dollhouse Sales Page. Here you will find what our sponsors are currently offering for the holidays. Below you will find sales of all sorts. Of course as you guessed it, dollhouse related goodies as well. So be sure to search for the desire of your miniatures heart in these outlets too. Anything we thought you may be interested in for you, your little ones or family. You will find here. As we find deals we can offer you we will add them to this page. This is very much a work in continuous progress. So drop by often to see what deals we have found for you next. Go to any Section on our Dollhouse Sales Page from here. . .
For dollhouses, their miniature accessories and furniture check out Amazon. You know they carry it. And if they do not one of their merchant associates does. At any given time of the year find abundant deals available in this category. DollHouseDesigns.com have great miniature house plans at reasonable rates. Anyone interested in getting imaginative, ready-made plans should check them out. Creator Jon Lash has done an exceptional job. Study his ways of doing things and learn even more about your miniature hobby. After all that's what this hobby is all about. Learning more, having more fun and relaxing while we do it. After having bought his plans ourselves we were very pleased with all he has supplied. You will not be disappointed. Return to Category Index Top of Page. Enjoyable collectibles and hobbies. This category features woodworking information, trains as they are a related dollhouse type topic, crafting and sewing supplies. As you explore all of these offers make sure to search each retailer for good dollhouse usable ideas. Use keyword: Thomas Kinkade to search site. Trains, trains, and more trains. We know that model railroading and miniatures are closely related. Check out all the deals from clubs to designs to more of the how-to's. 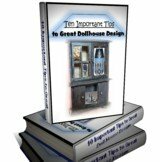 Look into using this knowledge to further your dollhouse hobby. What all these sites have can teach you even more about minis. Books. People who love books will love this category. At-the-Doll-House.com will willingly say that they are bookworms. If you want great prices on dollhouse instruction manuals and how-to topics head for these book departments. Search for your favorites here. Refresh page to display more selections. Personal Designs and more available in this section. Just waiting for you to enjoy. Explore all areas you never know what is in store until you step out to see each of these gift ideas. These are what you would call more "Pamper YOU" items than any other category we have featured. Now that you have imagined in miniature look for the new in your full-size world. On our dollhouse sales page you never know what you will encounter that will amaze and delight. Food. We all need and enjoy it. Some very much, others a little, but it's all here to make your mouth water for the holidays. On our dollhouse sales page these look so good you would like to serve them up now. main dollhouse sales page...Go there now.